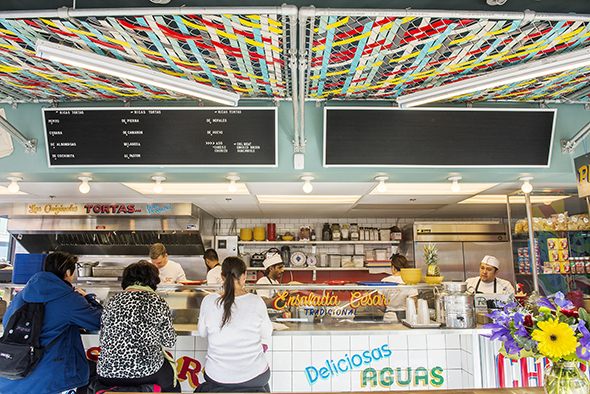 Torteria San Cosme is a Mexican eatery in Kensington Market that doesn't do tacos. 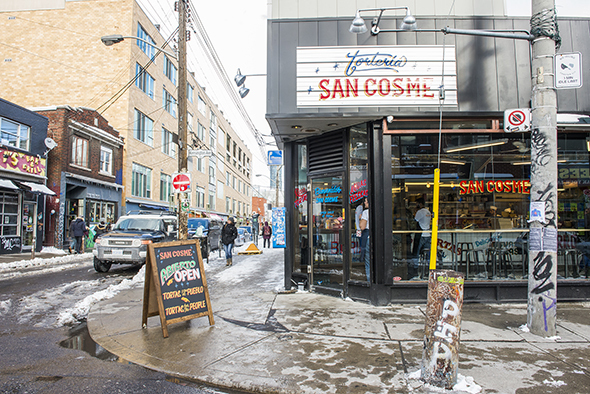 Found on the corner of Baldwin and Kensington Avenue, the sandwich shop is from the same folks behind Milagro . The concept is largely made possible by truly excellent custom-made pan teleras from Blackbird Baking Co. . The ultra fresh bread is sturdy, thin crusted, soft and squishy and is the foundation for the nine sandwiches on the menu. There's the Milanesa ($10.75) featuring breaded chicken and manchego cheese, the Pepito ($11.50) loaded with seared flat iron steak with panela cheese, and De Huevo con Chorizo ($10) a breakfasty bun topped with scrambled eggs, chorizo, smoked bacon and Oaxacan cheese. 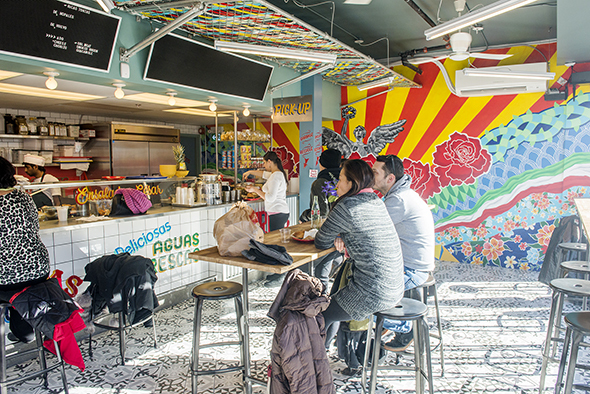 The colourful space from Toronto design studio tongtong features patterned tiles, bright murals and hand lettering advertising Churros Calientitos and Aguas Frescas from Brush Boys . 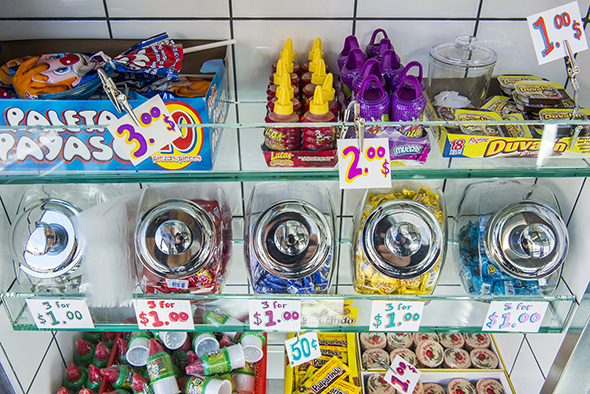 Ordering takes place at the counter stocked with candy while rows of stools hug the sizzling kitchen and the perimeter and in between. 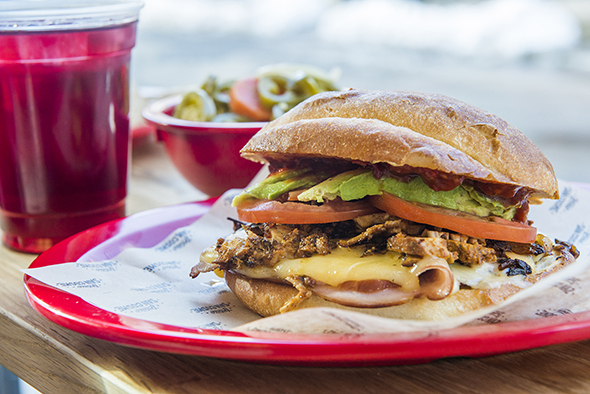 I try the Cubana ($12) built with layers of smoked ham and adobo pork slow roasted and then griddled before being smothered with melted gouda and topped with sliced avocado, tomatoes, chipotle sauce and spicy dijon. It's a good sandwich, the kind I can't wait to go back and eat again. The two types of pork contribute bold and distinct flavours and even the mustard and chipotle sauce works in unison. The house hot pepper mix, Anhalt's mother's nanny's recipe, are no joke and can ramp up the spice level as desired. 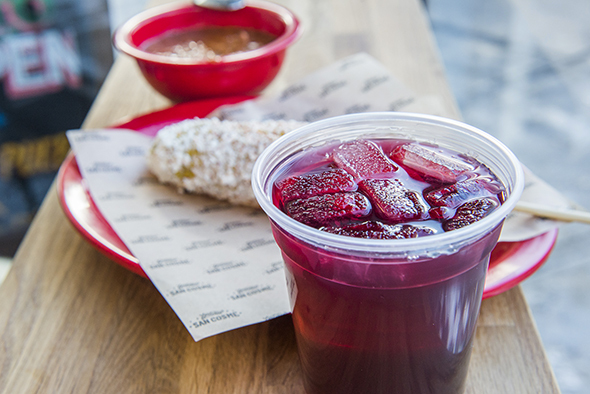 Aside from hearty handheld creations, there's house-made aguas frescas like horchata, tamarindo and jamaica ($2.75) and a a line-up of antojos including fruit sprinkled with chile piquin ($5.50), ensalada cesar ($6.75) and papas del puesto ($3). The Charros ($3.75) is a hearty stew of bayo beans with bacon, chorizo, serrano chilies and tomato. This is comfort in a bowl boasting rich, smoky flavours. 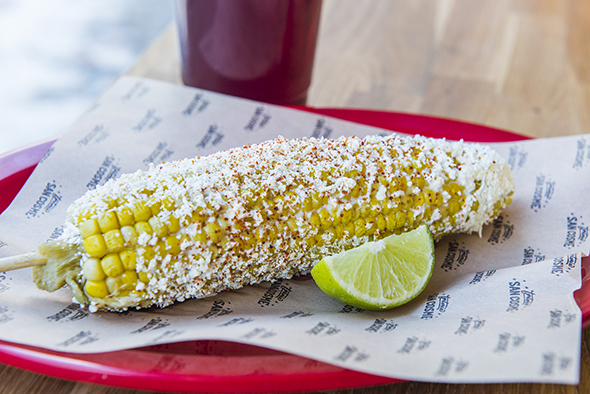 I also try the elote and esquites ($3.75). 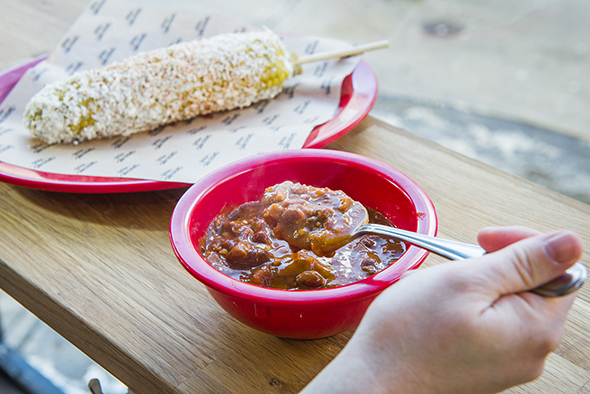 The former is steamed corn on the cob creamed up and rolled through cotija cheese and dusted in chile piquin, while the latter features nibblets stewed with epazote and onions and served in a bowl with the same crema, cheese and chili garnishes. They're both good, and I wasn't expecting to like one more than the other, but I do. 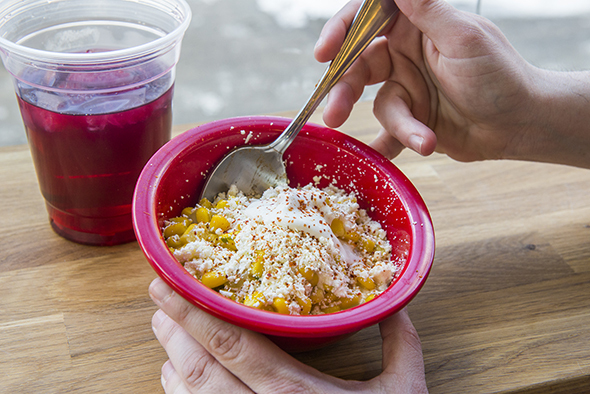 The addition of sweet onions in the esquites is subtle but delicious. I want to eat the churros (I saw an order pass by and they look like chunky chips dusted in sugar and squirted with cajeta) but they'll have to wait for another day. 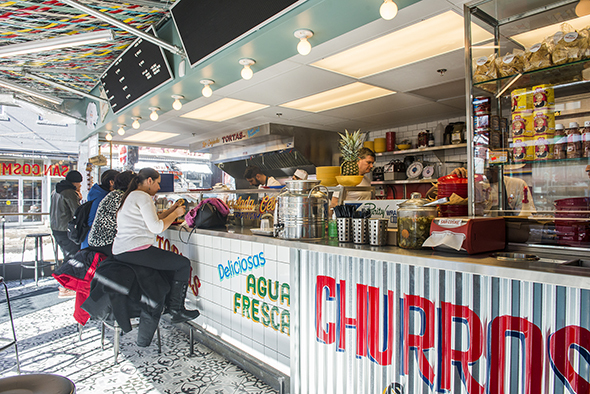 Tortas are way more filling than tacos and with the option to make any sandwich a combo (+$3) with a side charro, esquites, or ensalada cesar, it's unlikely to leave unsatisfied.